Former President George H. W. Bush shakes hands with University Provost Alan M. Garber, right, as he receives his honorary degree from Harvard University Thursday. 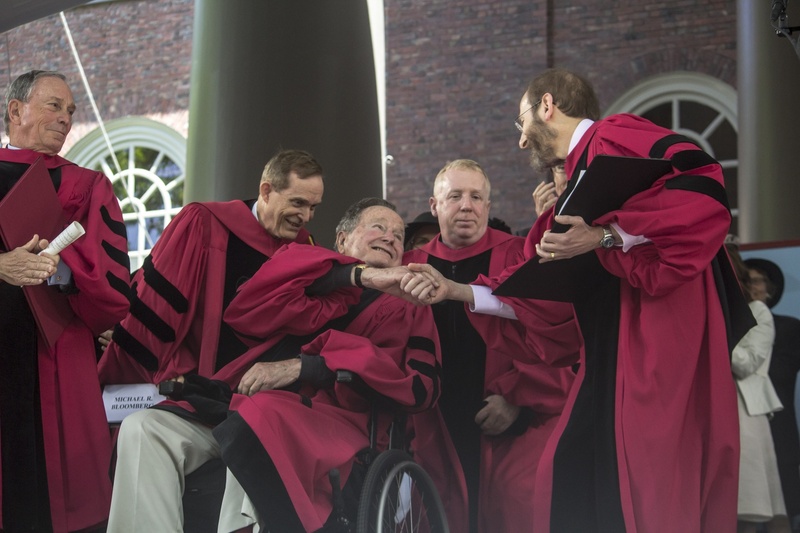 UPDATED: May 29, 2014, at 1:49 p.m.
Former President George H. W. Bush received one of eight honorary degrees at Harvard’s 363rd Commencement Exercises on Thursday. “With faith courage, and service true, his eyes ever fixed on points of light, he piloted our nation through changeful skies,” University President Drew G. Faust said as she awarded the 41st president of the United States a Doctor of Laws degree. Bush was joined as an honorand by acclaimed Chilean author Isabel Allende, famed soul singer Aretha Franklin, Georgetown Law professor and former Harvard Corporation member Patricia A. King, botanist Peter H. Raven, Fine Arts professor emeritus and former director of the Fogg Art Museum of Art Seymour Slive, and Nobel Prize-winning economist Joseph E. Stiglitz. Bush arrived around 8:30 am and spent about 15 minutes in Massachusetts Hall before posing for pictures with Faust, Provost Alan M. Garber ’76, and other honorands. After the ceremony outside of Mass. Hall, Bush was pushed in a wheelchair through the Old Yard and into Tercentenary Theater, where thousands had gathered for the conferring of degrees. A Republican, Bush served as president from 1989-1993 after spending eight years as the nation’s vice president. He was born in Milton, Massachusetts and attended Yale College. At 89, he is the oldest living former president. 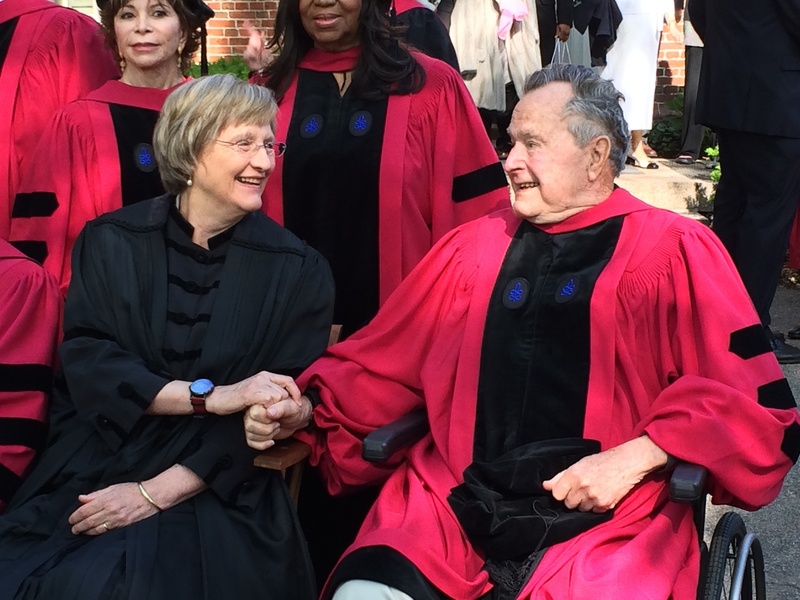 University President Drew G. Faust and President George H.W. Bush await the taking of a photograph outside of Massachusetts Hall Thursday morning, hours before Bush was to receive an honorary degree. The last to receive his honorary degree, Bush was praised for his work on the North American Free Trade Agreement, the Americans with Disabilities Act, and his role in the end of the Cold War. Garber, who made pointed jokes about Yale throughout his remarks on Bush, began his speech by referring to Bush’s days as a cheerleader at his alma mater. The end of his speech elicited a standing ovation from the crowd in Tercentenary Theater. When the collective star power of Lady Gaga, Oprah Winfrey, Deepak Chopra, and more special guests amasses inside Sanders Theatre for the launch of a new anti-bullying foundation on Wednesday, protesters will gather outside to ask Harvard to shine a spotlight on a long-gone group of people as well.